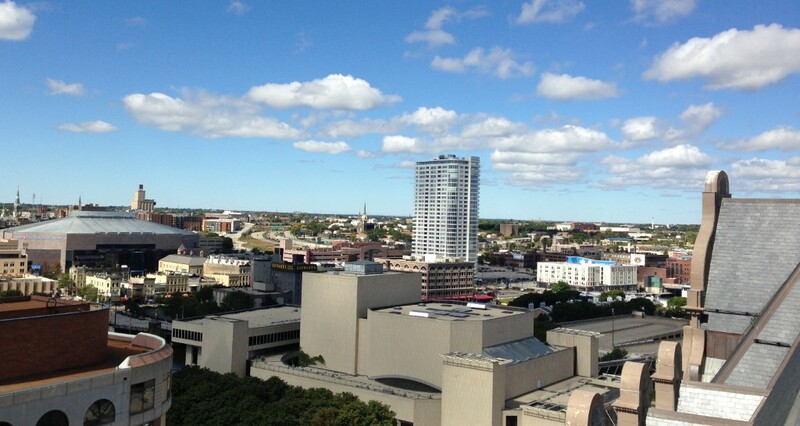 The Moderne rising in the distance as viewed from the roof of City Hall. Photo by Dave Reid. When House Confidential first visited Chris Abele with a story in August 2012, the Milwaukee County Executive was then living with his wife Miriam Abele and three young daughters on N. Lake Drive in the largest mansion in the city. In January 2015, a Milwaukee Journal Sentinel article by Dan Bice had the headline, “Chris Abele, Wife to Divorce Soon,” and House Confidential immediately started wondering how the split would affect the Abele family’s domestic situation. Even the largest home in the city — a “castle,” as we dubbed it — cannot function as a house divided. 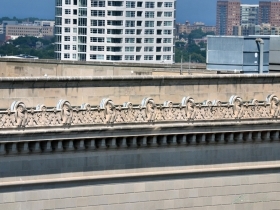 Today, at the end of 2015, the Abeles have yet to file their collaborative divorce papers, but we do know that Chris Abele has moved from the Lake Drive mansion (which remains in his name alone) and has purchased a condominium at The Moderne, 1141 N. Old World Third St. Make that two condominiums — and high floor ones, at that, just one story short of the top floor of the 348 foot building, which is the tallest in the state west of the Milwaukee River. Abele’s 8,132 square foot double condo is among the larger ones in the city, and it appears he controls more space in the building than any other property owner except the developer Rick Barrett and his various corporate entities. 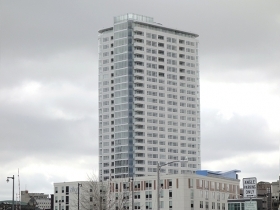 Only 14 units of the building are condos at this time, and most of them have been sold, with Abele’s being by far the largest and most valuable. The remainder are apartments and Carson’s Restaurant. Altogether the County Exec’s compound includes six bedrooms, six full baths, two half-baths, the requisite number of living rooms and kitchens along with four parking spots in the heated garage of the building. A mere recitation of dry statistics will show how far Abele’s living standard has declined since his move. Whereas his old home had 10,743 square feet of finished living space, along with a full, 4,104 square foot basement, Abele now must contain himself within the 8,132 square feet of his condominium prison. Where once he lived in a home with nine bedrooms, he now has but six. Six were the fireplaces in his old home, yet now the embers have died for the County Executive’s hearth, since the Moderne has no such wood burning amenities to cast their glow on a winter’s eve. 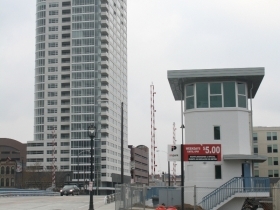 On the plus side, Abele now has eight toilets instead of seven, and the Moderne’s concierge stands ready to provide room service and other amenities, like package delivery and dry-cleaning drop-off, so that extra toilet to scrub should not interfere with the executive’s busy schedule. Management will send somebody up to take care of things. Hungry after a long session with the County Board or another headline-generating tiff with Sheriff David Clarke? Try Carson’s “Silver Cart Service,” bringing the best of barbecue right to your room! There is bicycle storage, a workout room that must be a plus when Abele recruits new members of his security detail, and a community party room that fits 50 people — or about a fifth of what Abele can comfortably squeeze into his pied a terre. The story of the Moderne is of the “you gotta be crazy to build there” sort that has a place in development lore. With a powerful vision, a love for Milwaukee and an intense drive Rick Barrett saw The Moderne through from initial sketches to final execution exactly as he envisioned it. Denied by HUD 37 times, Rick continued to push forward, knowing that The Moderne would be and is the catalytic force that the Park East Corridor needed. Back in 1894, the block of the Moderne, then between Third and Fourth, Chestnut [Juneau] and Prairie [Highland] streets, had a Wax Paper & Twine store, a couple of wholesale liquor companies, an upholsterer, a trunk factory and a “Horse Hospital” among its many enchantments. The site of the Moderne itself was a “Photo Gallery,” one of many downtown then. Nearby were “boarding houses,” as they were politely termed, where you could find a room to flop for one-fifty [$1.50] a night! Today, you needn’t be Chris Abele, or an NBA star, to be able to say you slept in the Moderne, the tallest structure between the City Hall and Minneapolis. You can still rent a furnished room overnight (they call them “Hospitality Suites” nowadays) and the rate is still one-fifty — that’s $150. Inflation! Care for a longer-term stay at the Moderne? 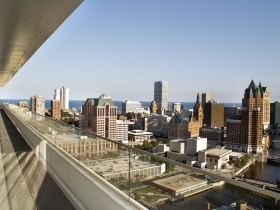 There is one unit, known as “Twenty-Nine 02,” available for sale on Abele’s floor for just under $1,000,000. Size: 8,132 square feet in two adjoining units. Rec Room: There is a “Workout Room” where Abele’s bodyguards can stay buffed while waiting for the boss. Assessment: Land: Abele’s 3.21% share of the .40 acre development’s land value totals $25,200 for the two units. [$–/s.f.]. Improvements: First unit: $1,683,500, Second Unit: $1,264,800. Total: $2,973,500. Current owner purchased both properties 03/24/2015 for a total of $2,100,000. Taxes: First Unit: $50,379.29, Second Unit: $37,829.55. Total: $88,208.84. Of that sum, $15,706.18 is county tax which helps to pay Abele’s salary of $134,595. Garbage Collection Route and Schedule: Route N/A; Schedule N/A. Collection Day N/A. Garbage is collected by a private firm. Polling Location: Highland Gardens Apartments 1818 W. Juneau Ave. Transit Score: 68 out of 100. “Good Transit.” Soon you will be able to take the streetcar from here to the Couture. How Milwaukee Is It? The residence is 0.5 miles from City Hall and 0.7 miles from the Courthouse. I guess I don’t understand the purpose of this snarky article. If you want to write that County Exec Abele has purchased a new residence, fine (although I don’t think it’s really necessary – there are enough things to write about his public life if you must). And to add all the snide commentary and drag his wife into it – why? If you don’t like Chris Abele or don’t like his politics, that’s fine too, but this serves no purpose. Other than perhaps to make a writer who sounds tinged in jealousy and the likely negative commenters who will chime in, somehow feel better about themselves. 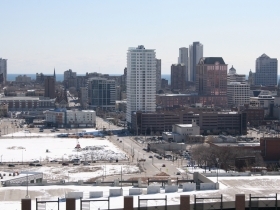 This article saddens me – I was considering making a donation for Urban Milwaukee’s expansion (particularly with the opportunity to double it with Barry Mandel’s challenge), because I generally like the work of UM. But this tabloid crap is not the direction I thought you were going. 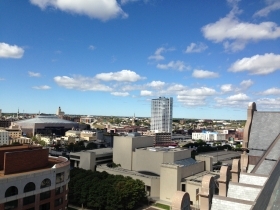 Maybe we need a REDUCTION at Urban Milwaukee rather than an expansion. Just sad. I see you are not familiar with Michael Horne’s House Confidential articles. That’s okay! But I do suggest you go through and read them. He typically will write about the living quarters of various city celebrities (of some sort or another) and dives into the history of the house. Mr. Horne is a snarky fellow and so he likes to have fun with it and include some snide comments where he can. They are generally pretty funny so just take them in stride and laugh. It has nothing to do with politics or liking/disliking the person. The list at he bottom of the article provides a handy list of Michael Horne’s ‘victims’. They include sports players, Mayors, Newaukee Founders and right wing radio announcers. This isn’t a hit piece but rather a part of an ongoing feature that has been around for many years. As I mentioned before they are a good read so I suggest you check them out. Since I’m a Milwaukee history nut, I always find Michael Horne’s House Confidential articles very interesting. Keep up the great work, Michael. Sounds like the author is just jealous and petty, nothing more nothing less. In any case, it’s good to know Abele’s landed on his feet after his second divorce and latest bout of woman trouble…. Paul, it’s not jealousy or pettiness to lampoon a public figure (born with a silver spoon in his mouth) who has chosen to make it his “business” to run roughshod over the common good in order to curry affirmation from his plutocratic peers. Incisive scribe Michael Horne (Milwaukee’s modern-day Dorothy Parker) does us a favor by informing, in an entertaining manner, that this would-be emperor has no clothes–and now, alas, no fireplaces. Pshaw! P.S. Horne is an equal-opportunity satirist. Paul knows that anyone even slightly critical of a rich dude is just jealous. Fox News told him so.